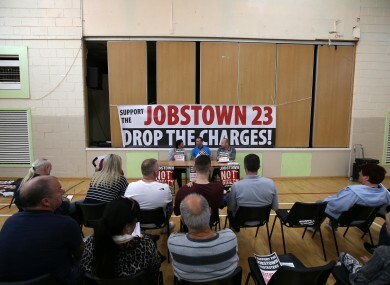 The youth (17) denied falsely imprisoning the former Tánaiste and her advisor Karen O’Connell who were allegedly trapped in two garda cars for three hours during the demonstration at the Fortunestown Road in Jobstown in Tallaght, on 15 November 2014. The judge in his case said he would impose a conditional discharge on both charges with a term that he must not re-offend within next nine months. He will also be spared a criminal record in this case. His trial at the Dublin Children’s Court resumed this morning for Judge John King to decide if he was going to throw out the case. The 17-year-old’s legal team contended that it is not accordance with Irish or European human rights laws and that the State has not made out a case to answer. Burton had been at a graduation ceremony at An Cosan education centre when a water protest took place outside. She told the court earlier that she was frightened and did not think she had the alternative of being able to get out of garda cars surrounded by people shouting abuse and banging on windows. Last month, the State closed its case and on Tuesday, the boy’s legal team asked Judge John King to dismiss the charges. The boy’s barrister Giollaoisa O Lideadha SC told Judge King that the the case is “unprecedented” and is a “recipe for totalitarianism”. However, Judge King held that the liberty of the then Tánaiste and her advisor were restricted at numerous stages and the teenager was guilty based on the evidence given to the court. Email “Teenager found guilty of false imprisonment of Joan Burton during water charges protest”. Feedback on “Teenager found guilty of false imprisonment of Joan Burton during water charges protest”.